Sandy Felton talks to garden designer Jonathan Snow, as he aims to achieve his dream of creating a garden at the 2018 RHS Chelsea Flower Show, with a stunning design inspired by the Winelands of the Western Cape of South Africa. I always like it when dreams come true and so I suspect I am secretly rooting for London-based garden designer Jonathan Snow, who has always dreamed of creating a garden at the RHS Chelsea Flower Show. Jonathan will be designing the ‘Trailfinders: A South African Wine Estate‘ garden and not only will his Chelsea dream become reality but his garden will be on the fabled Main Avenue – a rare honour as designers have usually had a number of years ‘cutting their teeth’, so to speak, at other shows or in smaller categories before reaching this hallowed space. I asked him what lay behind his inspiration for the garden and he explained that he was on holiday with his wife two years ago in South Africa and that she wanted to visit the wine producing regions of Franschhoek and Stellenbosch: “We spent a few days in wine country, doing a few wine tours and plenty of tasting and one evening, as we sat on the terrace of a lovely old homestead with a bottle of wine, gazing out over the pretty garden, with vineyards beyond and the mountainous landscape in the distance, the idea for a garden started to form,” he said. As the days went by Jonathan learned about the endemic vegetation of South Africa, known as fynbos and the more he saw of it the more he became entranced. 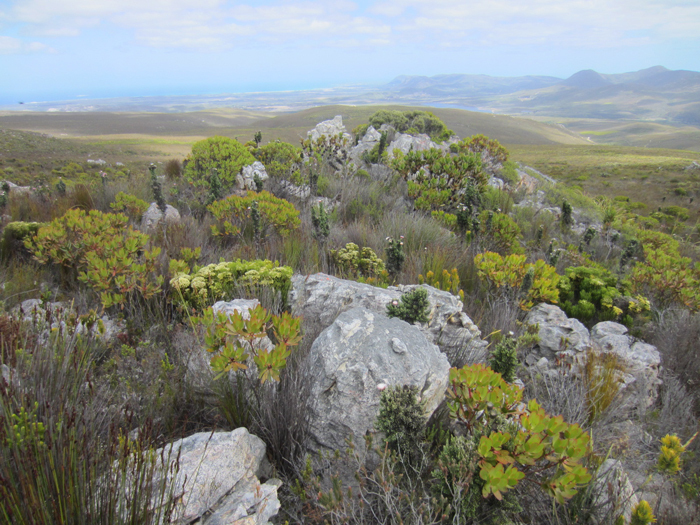 The name fynbos is derived from the dutch word Fijnboch – when literally translated it means ‘fine bush‘ – to be found in an arc-shaped belt northwards from the Cape Peninsula. 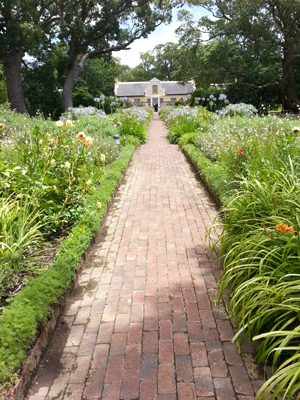 It is a small belt of natural shrubland or heathland forming part of the Cape Floral Kingdom. Fynbos (or Fijnboch) is a perjorative slang term used to describe the scrubby treeless environment that early Dutch settlers complained about when trying to find suitable timber for construction. Jonathan explains that fynbos is by far the dominant vegetation in the Cape Floral Kingdom, which is the smallest of the six floral kingdoms in the world. This Floral Kingdom covers an area of 90,000 sq km (about the size of Portugal) and there are 9,000 flowering plants of which 6,000 are endemic, meaning that they occur nowhere else in the world. The British Isles are nearly 4 times larger, have less than 2,000 plants, of which only 20 are endemic. “The Cape is rugged, dramatic, wild and unspoilt, and a botanist’s (or garden designer’s) dream due to the incredible biodiversity. 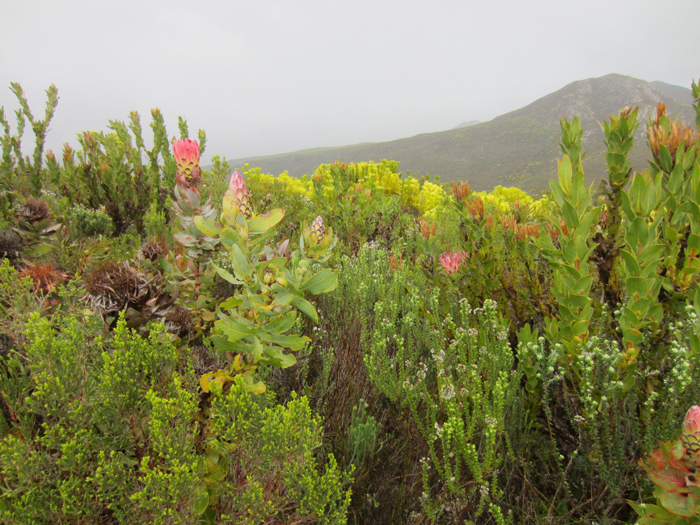 It’s under threat from agriculture, urbanisation and non-native invasive species and I also think it’s generally underappreciated so time to fly the flag for Fynbos,” he says. The show garden comprises four distinct areas – the homestead garden, fynbos landscape, post-fire fynbos landscape and vineyard. The Homestead garden will contain some plants used in cultivated forms, or relatives, of fynbos plants with other native South African species alongside more traditional cottage garden planting. In the vineyard, there will be roses (traditionally planted at the end of each row to provide early warning of disease) and a cover crop of annuals sown between the rows of vines. The Fynbos landscape will comprise members of the proteoid (tall protea shrubs with large leaves), restioid (wiry, reed like plants), ericoid (heath like shrubs) and geophyte groups (agapanthus, gladioli etc), which grow in the slopes above the vineyards and the post-fire Fynbos landscape will represent recovery after a recent fire – fire is an integral part of the lifecycle of fynbos, it removes old growth and returns much needed nutrients to the soil. In the absence of competition from older and larger plants, the scorched landscape is gradually replaced by colourful bulbs, fresh annual seedlings and re-sprouting plants. As a designer, Jonathan is known to like contrasts so I asked him how he would be achieving contrast in the Chelsea garden: “The biggest contrast I hope to achieve will be between the fynbos planting and the homestead planting,”he said. “The fynbos planting will be wild, leathery leaved and dry, with occasional splashes of bright colour, as you would see in such a landscape, whereas the homestead planting will be romantic and charming, fresh and lush, with softer tones, contained by neat evergreen hedging, that you would expect from a traditional homestead garden.” Jonathan wants to repeat some of the fynbos plants in the homestead garden, using them in both settings: “For example, I hope to use agapanthus, gladioli, kniphofias and pelargoniums in both spaces. I’m really interested in the provenance of plants and how they have been cultivated over the years for our own use in gardens,” he added. 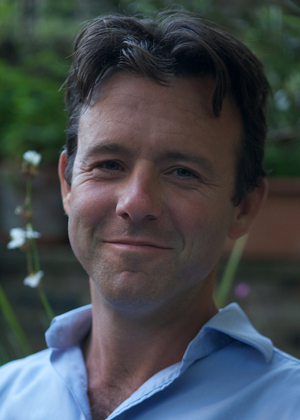 I was interested to know if Jonathan felt he had been influenced in his design career by any particular landscape architect: “I started working for Arne Maynard, and then worked briefly for Tom Stuart Smith,” he explains. “Arne gave me the confidence to tackle big spaces, trust my judgement and how to appreciate all the little details that go into a garden and Tom encouraged me to constantly challenge myself and my ideas and keep evolving as a designer. I will always be grateful to them for my time under their tutelage,” he says. The design for the show garden does indeed look stunning and I began to wonder how Jonathan would bring together the individual four components: “The first thing I noticed on holiday was the architecture of the homesteads – there’s so much history and character in these buildings. 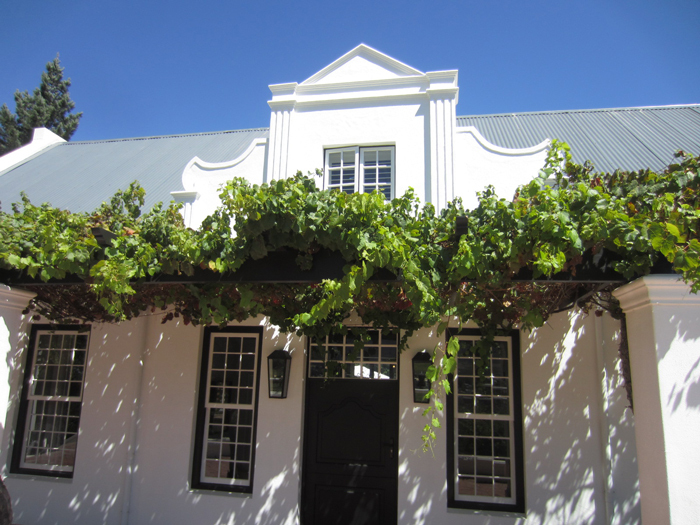 Then I took in the pretty gardens and vineyards and I found all that very appealing, it’s one of the reasons so many people visit this part of South Africa,” he says. Generally speaking, fynbos plants are not easy to find outside South Africa and Jonathan found himself hunting all over Italy, Spain and Cornwall to get a good selection: “I bought 10,000 (mostly annual) seeds from Kirstenboch, nearly all of which have germinated and are now happily growing at Kelways in Somerset.” What will be a major challenge for him will be recreating the burnt fynbos. 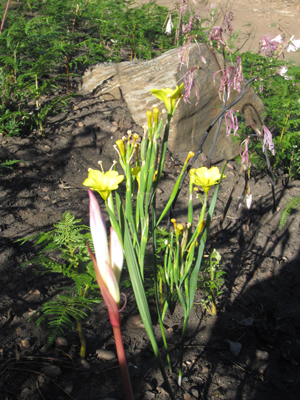 As he points out fynbos has this incredible ability to regenerate quickly after a fire with bulbs appearing in just a few days after the fire dies down: “At the moment we are looking into all sorts of ways to achieve this look, without actually setting fire to thousands of pounds worth of plants and trying to time the flowering of the bulbs correctly,” he says. His further challenge is making that area look beautiful, rather than just a scorched landscape, so he has plenty to think about with that part of the design. You have to hand it to Jonathan, not only has he had the vision to design a large Chelsea show garden, he secured an established Chelsea sponsor in Trailfinders and an experienced contractor in Mark Richardson’s Stewart Landscape Construction, not to mention lining up some of the best plant nurseries in the UK and Europe to help source and grow his plants. It’s fitting that the sponsor of the garden is the UK’s leading independent tour operator, Trailfinders, as they tailor-make holidays to South Africa for thousands each year. So, all the ingredients are in place to make Jonathan’s dream come true and I have a hunch that this garden is going to be something special. Can’t wait to see it.